Yes, Phases 6-7 tend to be the best for SSWs, so part of the forecast SSW involves that. I don't believe it will have much of an effect on the MJO weakening into P8 however. Thank you , yes it’s forecast to drop amp into 8 hopefully not into the dreaded COD , what would be an overall average strength of RMM2 ? 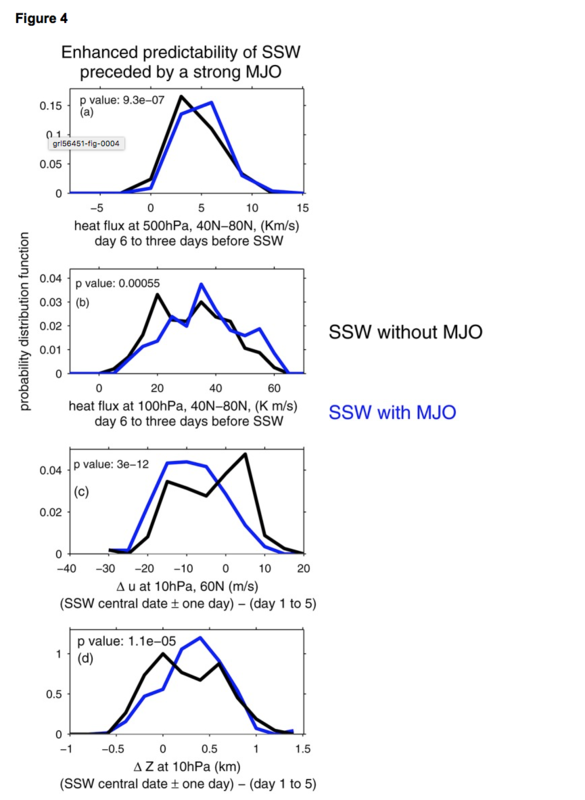 A study into the relationship between the MJO and a SSW. I have inserted the summery of the linked document and associated charts mentioned in the summary. A link to the full document is attached also. Stratospheric variability has important implications for surface climate (Baldwin & Dunkerton, 1999; Limpasuvan et al., 2004; Polvani & Kushner, 2002), and hence, it is crucial to understand the time scale over which stratospheric variability can be predicted. Here we have examined whether tropical convective anomalies associated with the MJO modulate stratospheric variability in operational subseasonal forecasting models, and to consider the duration over which this association can potentially lead to enhanced predictability of stratospheric variability at least in a probabilistic sense. For two different operational models and for nearly all SSW events, reforecasts which maintain anomalously strong MJO‐related convection simulate more realistic stratospheric variability up to 4 weeks later. Furthermore, stratospheric variability is more predictable for SSW events that were preceded by a phase 6/7 MJO event as compared to SSW events not preceded by a strong MJO event. It is interesting to note that the BoM model has a model top at 10 hPa yet is still capable of capturing the relationship between the MJO and SSWs (as in the low‐top model considered by Garfinkel et al. (2014)). However, the BoM model struggles to capture SSW (cf. Figure Figure2),2), similar to the low‐top models contributed to the Coupled Model Intercomparison Project phase 5 (Charlton‐Perez et al., 2013). Furthermore, we note that in Figure Figure4,4, the BoM model captures weakening of the vortex over the 20 day period preceding a SSW even for SSW events not preceded by a strong MJO, though the weakening is significantly larger for SSW that were preceded by a strong MJO. This suggests that weakening of the stratospheric vortex may be predictable in a probabilistic sense even without anomalous MJO conditions. 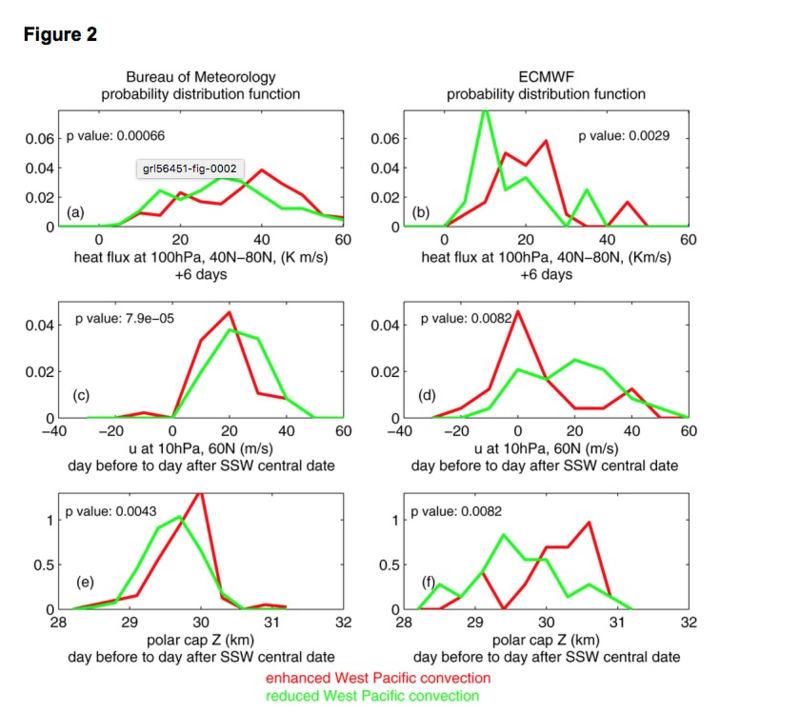 We note the caveat that while reforecasts with strong MJO‐related convection simulate stratospheric variability closer to reality, the reforecasts examined in this study generally do not simulate an SSW: Only the tail of the probability distribution function for enhanced convection in Figure Figure2c2c extends to negative zonal wind values at 10 hPa, 60°N. Second, we have not yet addressed whether knowledge of a developing MJO actually contributes skill toward forecasting a SSW, though we plan to explore this question for future work. However, results of this work, combined with that of Garfinkel et al. (2012), Liu et al. (2014), and Garfinkel et al. (2014), suggest the potential for predictability of SSW events at least in a probabilistic sense up to 4 weeks in advance given that the evolution of the MJO can be predicted with some skill up to a few weeks (Marshall et al., 2016; Vitart, 2017). Could someone be so kind to tell me when the MJO forecasts on NOAA update daily ? And a rough uk time ? Hi Ray, while I take a quick break from my work (my online business means that I'm busiest from Saturdays to Wednesdays) I'll try to address several of your recent queries together. Just click on the blue tags to pull up the different model charts - not all of them work (eg: UKMO/UKME) stopped updating last July (part of site access politics and subscription issues I imagine). If you click on "MJO" in the left margin, it'll take you back to the direct NOAA link and only their own charts (updated more quickly) will show. Remember that other factors influence (enhance or suppress) the MJO amplitude especially, the ENSO state - the east Pacific based La Nina "had" been strongly impacting earlier in the winter and until quite recently (the Nina has weakened slightly in the last couple of weeks) with its stronger tropical Pacific easterlies (north-east trade winds) favouring the MJO in it's maritime phases but not in its west Pacific phases). All this being influenced by the (until recently) negative AMM , -FT and -MT which have all ticked strongly upwards recently (in a particular sequence) with the final time lag likely to coincide with the MJO while it's still in phase 7 at good amplitude. 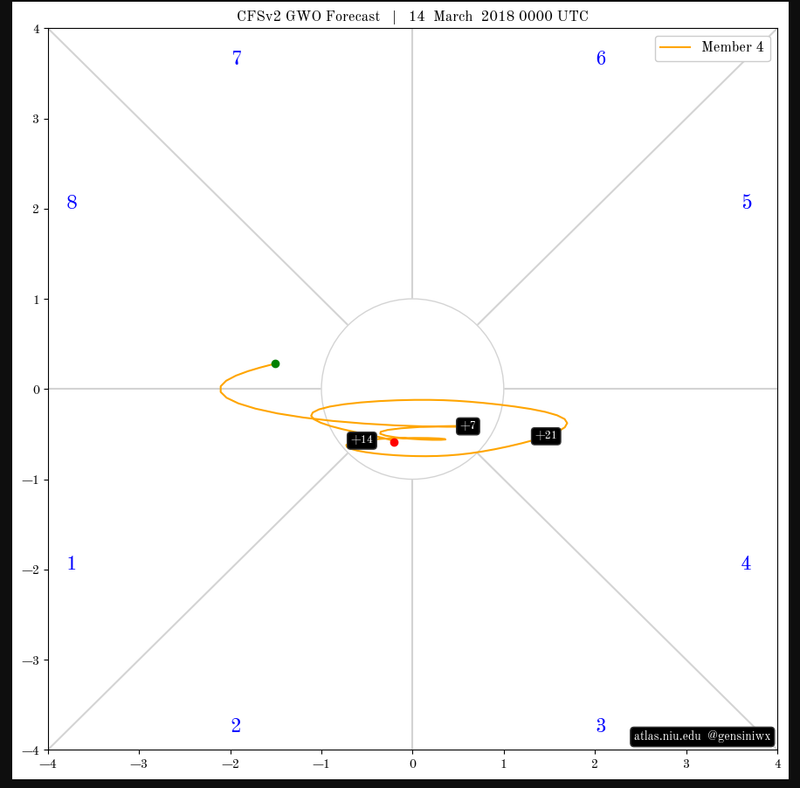 The MJO full cycle is around 30 to 45 days and only varies slightly (it can move into the COD and reemerge elsewhere but the phase cycles are always fairly constant). It is the strength or amplitude that varies much more. You also ask about the "average" strength which (I think) is not really important but the particular strength in a specific phase is important. I describe this in more detail in my post at the top of page 5. I'm very much learning all this myself and it's a good deal more complicated than my explanation. @Tamara and other specialists understand it rather better than I do. If you trawl back through the whole thread, some questions on the MJO have already been fielded and (usually) answered. There are also a few links to some papers covering several of the issues that I referred to above. The interaction of all the impacts and influences is a subject that we'll be exploring on this thread. There are many papers out there and considerable debate, some of it quite contentious. I invite any "MJO specialist" out there to provide a comprehensive post on this thread or put forward related matters for debate. Up to date study (January 11th 2018) on the joint influences of the MJO and the Stratosphere polar vortex on the northern hemisphere extratropical circulation. 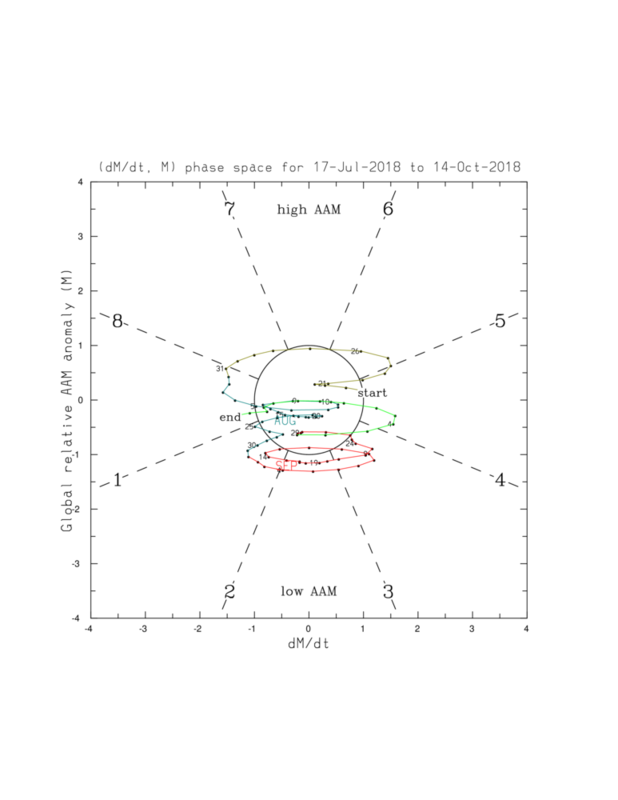 The presentation uses phases 3 and 7 of the MJO in its examples. Tropical pacific SST's are NOT the sole nor the largest source of climate variability for the North Atlantic/Eurasia winter. The stratosphere is a MAJOR source of variability. But, SSW's (the downward pathway) largely occur independently of ENSO. Models suggest 30% increase in SSW's during EL NINO which could contribute to seasonal predictive skill in the extra tropics. As the animation shows, the last few days have seen a big jump in stratospheric temperatures in Eurasia as a result of a persistent rise in mountain torque values. Without going too in-depth, high values of mountain torque in certain regions of the world (in this case, East Asia) can lead to sudden stratospheric warming (SSW) events. "In the model stratosphere, mountains increase the amplitude of stationary disturbances partly because they enhance the energy supply from model troposphere to the stratosphere". Which to me sounds like it's saying MT does impact the stratosphere? Which I therefore presume is a source of disturbance that can disrupt the SPV? Any further thoughts on this most welcome! Thank you. The blog post unfortunately links to the current live version of the 10mb temperature anomaly animation but from the text it is obvious that there was an early season warming, over Siberia or east Asia. It also makes the common mistake that the warming somehow comes from the region below - it doesn't, it is descending air that warms adiabatically. The description in the chart below is self-explanatory, but it shows during a warming over Switzerland, a parcel of air descending around 4km in height over a 3 day period from over the US, warming around 40 K in the process. Regarding the NH winter storm-track distribution, results of this study suggest that NH extratropical heating is the most important forcing, consistent with the suggestion by Hoskins and Valdes (1990). Zonal asymmetries in NH extratropical heating act to force the Pacific storm track to shift equatorward and the Atlantic storm track to shift poleward, attain a southwest–northeast tilt, and intensify. It appears to be the most important forcing responsible for explaining why the Atlantic storm track is stronger than the Pacific storm track. Tibet and the Rockies are also important, mainly in suppressing the storm tracks over the continents, forcing a clearer separation between the Pacific and Atlantic storm tracks. In contrast, asymmetries in tropical heating appear to play only a minor role in forcing the model storm-track distribution. Really? What does the global meteorological community see as orthodox when it comes to explaining global weather? 1. A linkage between weather changes occurring in widely separated regions of the globe. 2. A significant positive or negative correlation in the fluctuations of a field at widely separated points. Most commonly applied to variability on monthly and longer timescales, the name refers to the fact that such correlations suggest that information is propagating between the distant points through the atmosphere. A very strong Arctic major sudden stratospheric warming (SSW) event occurred in late January 2009. The stratospheric temperature climbed abruptly and the zonal winds reversed direction, completely splitting the polar stratospheric vortex. A hindcast of this event is attempted by using the Navy Operational Global Atmospheric Prediction System (NOGAPS), which includes the full stratosphere with its top at around 65 km. As Part I of this study, extended-range (3 week) forecast experiments are performed using NOGAPS without the aid of data assimilation. A unified parameterization of orographic drag is designed by combining two parameterization schemes; one by Webster et al., and the other by Kim and Arakawa and Kim and Doyle. With the new unified orographic drag scheme implemented, NOGAPS is able to reproduce the salient features of this Arctic SSW event owing to enhanced planetary wave activity induced by more comprehensive subgrid-scale orographic drag processes. The impact of the SSW on the tropospheric circulation is also investigated in view of the Arctic Oscillation (AO) index, which calculated using 1000-hPa geopotential height. The NOGAPS with upgraded orographic drag physics better simulates the trend of the AO index as verified by the Met Office analysis, demonstrating its improved stratosphere–troposphere coupling. 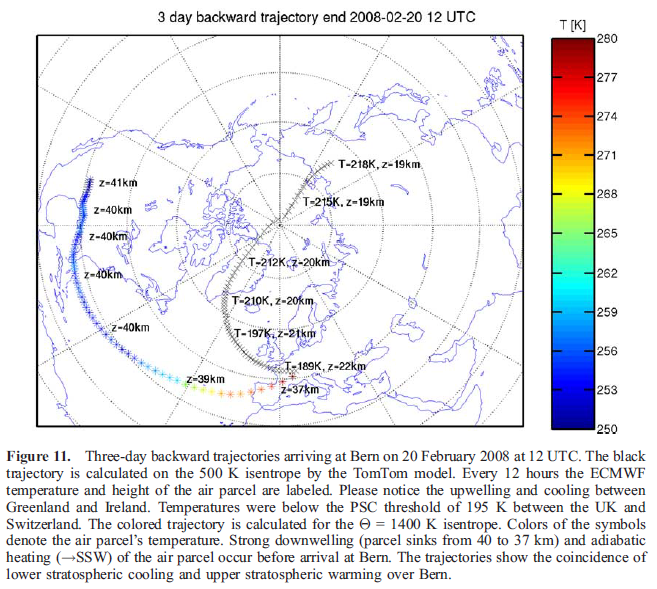 It is argued that the new model is more suitable for forecasting SSW events in the future and can serve as a tool for studying various stratospheric phenomena. I have not yet had time to read the full article and there are a great many links to many other papers on this subject. I shall slowly read through these during the coming weeks and report back on the most relevant ones in further posts on this subject. When our thread library is set up, I already have several hundred papers to go straight into it. So, I wonder if Interitus expected such an avalanche of information and contributors! I am aware of this paper, I made an indirect reference to it in this post a couple of years ago -https://www.netweather.tv/forum/topic/84231-stratosphere-temperature-watch-20152016/?do=findComment&comment=3338422. Those into the AAM side of things should be familiar with this gravity wave drag parameterisation problem, as it has been a source of bias in forecasting and reanalysis, resulting in 'missing momentum'. In my opinion the NAO is NOT a teleconnection. It is a measurement of relative pressure, and as such tells us nothing about what is driving the weather. So - not good enough for me whatever the experts write. If conventional meteorology sees the NAO as a factor then it is time to rewrite the convention. This thread is about understanding the factors that actually DRIVE the pattern. This is very different from taking measurements afterwards. 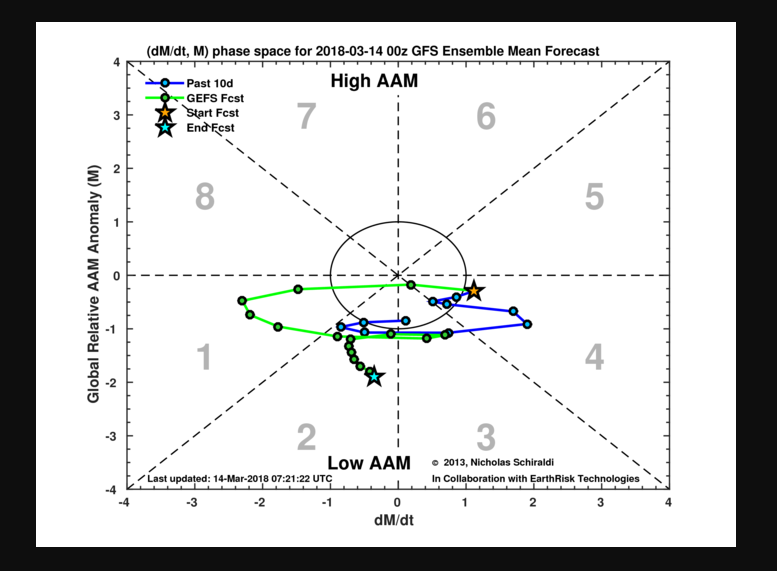 First thinking about AAM and its phase shift from negative to positive then back again, and then also the MJO cycle from start to finish. are these two constantly in sync? / linear? Secondly, Ive got a basic grasp now of Frictional and Mountain torque and there effect on AAM but I can't quite get my head around AAM fluxes and their part in all of this. Wee bit help would be appreciated thanks. Hi Interitus. Thanks for your comments and pointers to other reading material. I was planning to read up and maybe come back with any comments or questions, but as usual with these scientific papers they refer out to other research, so I'm still in reading and digesting mode! I'm particularly interested in understanding the various precursors (and sequence) leading up to SSW events, so if I do have any further points to discuss I'll come back in due course if I may. Mm? Could we see returning of blocking.. Isn't that about a 1 in 3.5million chance of seeing such? I thought 3 was impressive, I don’t have a clue but it sounds mightily rare. If GFS is right expect a big shake up I presume! Look away if you want spring warmth, the atmosphere does not want to behave it seems. 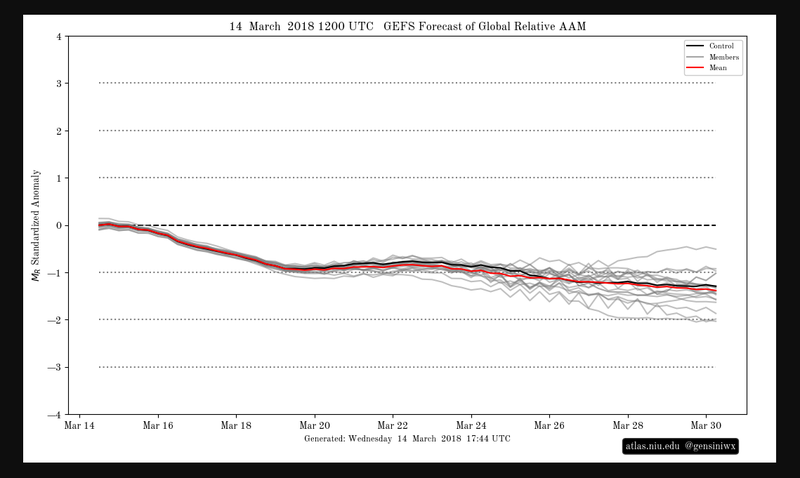 well the plot from the 6th of march was already a huge step and the 7th/8th are off the chart so we will not have long to see if the extreme verifies? I suppose if things are swinging wildly out of kilter then and extra 'push' come the next oscillation asnd you move out further? If the 4s.d. that supposedly kicked off the SSW still had energy rattling around then it may have formed a kind of 'constructive wave' and so helped spawn this? We need folk with more of an understanding to clue us up but I suspect this is shoving things outside their 'comfort zones'? Looking at the PV folk were saying it was on the wind down to final warming so maybe we should not be thinking SWW but a mighty final warming? The Jet , last time, pushed a pulse of above zero airs into the pole ( 6.1 on the north shore of Greenland with a bit of Fohn assist) so what will this do up there? could the Jet just pass over the pole and leave us well on the summer side of it with half the hemisphere in the same boat? I could do with some Saharan warmth!!!! Recent evidence from both observations and model simulations suggests that an Arctic sea ice reduction tends to cause a negative Arctic Oscillation (AO) phase with severe winter weather in the Northern Hemisphere, which is often preceded by weakening of the stratospheric polar vortex. Although this evidence hints at a stratospheric involvement in the Arctic-midlatitude climate linkage, the exact role of the stratosphere remains elusive. Here we show that tropospheric AO response to the Arctic sea ice reduction largely disappears when suppressing the stratospheric wave mean flow interactions in numerical experiments. The results confirm a crucial role of the stratosphere in the sea ice impacts on the midlatitudes by coupling between the stratospheric polar vortex and planetary-scale waves. Those results and consistency with observation-based evidence suggest that a recent Arctic sea ice loss is linked to midlatitudes extreme weather events associated with the negative AO phase. 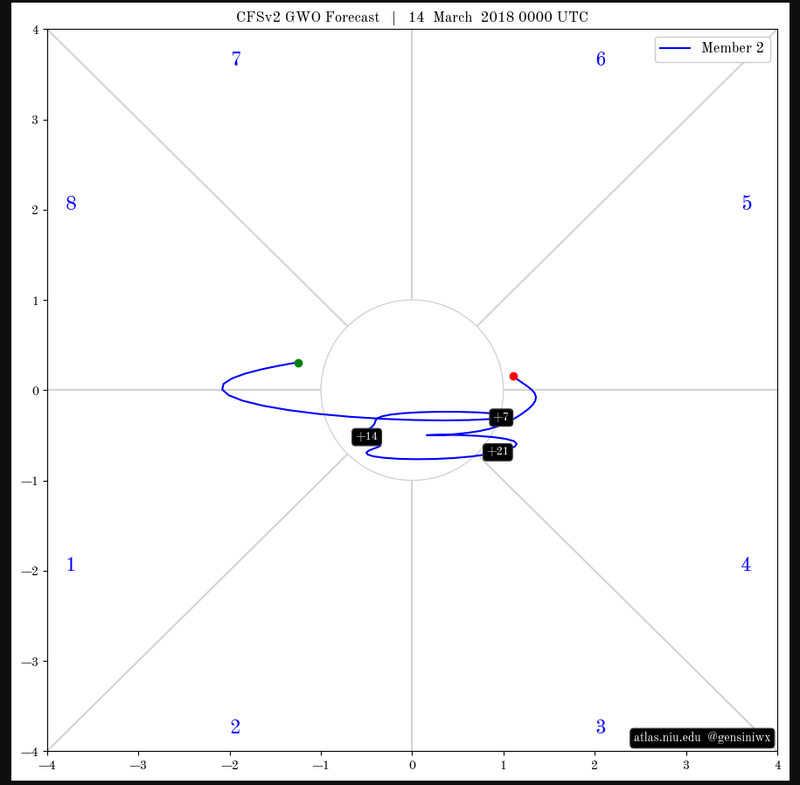 The atmospheric angular momentum (AAM) chart that was posted yesterday originating from that Michael Ventrice tweet appears to have been a plotting error or a technical fault. Source: Nicolas Schiraldi - link: http://www.atmos.albany.edu/student/nschiral/gwo.html Please note that the March 7th charts are liable to auto update tomorrow morning as the latest (March 8th) data is input. 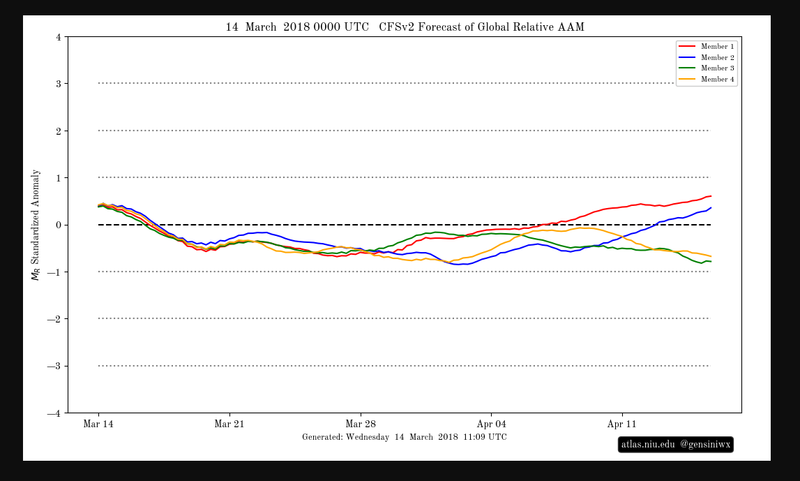 The GEFS current and forecast charts are known to have a permanent negative bias and generally understate the global relative AAM anomaly by around a factor of one. At the end of each day, one can obtain a "final analysis" of AAM with a much more accurate plot of the "current" position from another source. Unfortunately there is no forecast on this site. Please note that this chart shows the mid point of each phase with a hatched line rather than the full sectors as on the GEFS charts. Just like relative AAM, the torques are pretty neutral right now. Only NAMT (North American Mountain Torque indicated by the blue line in the chart) is trending marginally positive. The charts are usually 48 hours out-of-date and they tend to auto update in the late afternoon. Sometimes a "page refresh" does this. I would normally aim this type of post on the learning thread but it was appropriate on the MOD right now to clear up the misunderstanding in respect of yesterday's probable technical error on the GEFS AAM forecast chart. I posted the above on the MOD this morning to clear up the "AAM-gate" misunderstanding. I didn't realise that this matter had also transferred to the learning thread. What some of us who have been focusing on AAM do not understand is how Michael Ventrice could tweet this misleading chart without checking it out first. 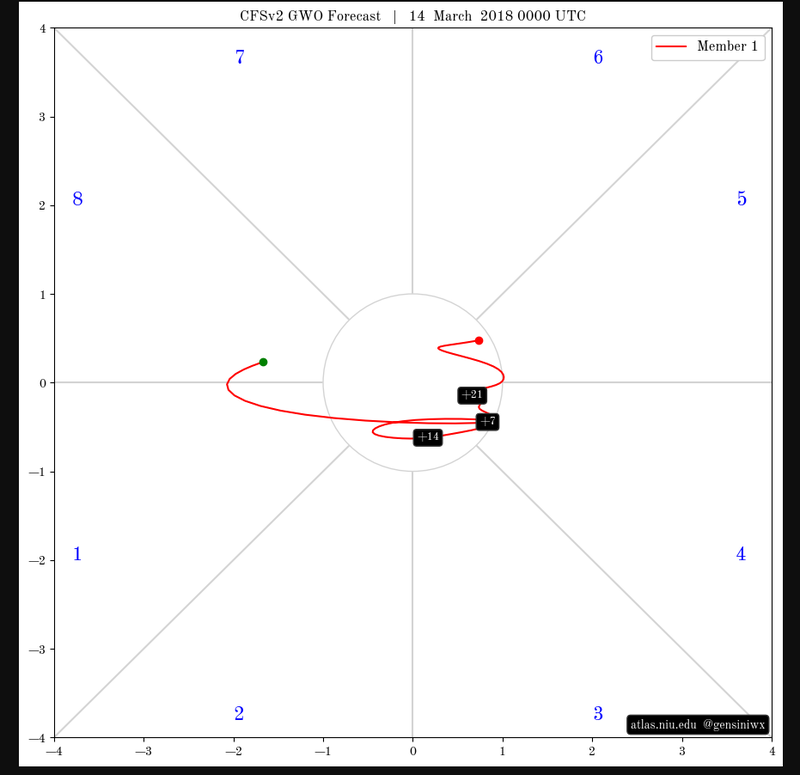 He must have a good understanding of the GWO phases and realise that this sudden change, given the other parameters, is not really possible (however unusual the current patterns are). It's likely that relative AAM will stay weak and benign for a while. When ENSO transfers from the Nina to a neutral state during the next 4 to 8 weeks (going by the latest weekly NOAA ENSO report) then we might see a spike in AAM around then.. In this post, I will provide a general update on some exciting developments for this Teleconnections Learning Thread". I have news of a brand new data source. I provide a link that we found to an American weather forum which is loaded with some very useful information, sources and links which are highly relevant to this thread. By way of example of the forum content, I will reproduce an excellent early paper on atmospheric angular momentum (AAM) with some easier to understand explanations. 1. A general debate and discussion on the causes of of the SSW - what triggered it, how it impacted and why it progressed so quickly, the role of some of the teleconnections and key drivers, comparisons to earlier events and what we can learn from this. As I always stress, we have no intention of competing with the strat thread and we intend to compliment their own inquest and review. There is likely to be a whole host of papers on various aspects of this event during the coming months and we shall ensure that the most relevant ones are reviewed. There is also a lot of really useful archive data that we shall be resurrecting. 2. Our "Telecnnections Learning Thread Library" should be ready to launch quite soon. @Paul has very kindly been working on some special software for our library. This will be a bolt on facility to this thread. We intend to house all the relevant teleconnection papers and links in the library. A small group of us will be working on this. It will constantly be serviced, edited and updated. There will be a comprehensive indexing facility to allow for quick searches on any aspect of the subject. Many papers will already have abstracts or summaries but some do not. For the most important ones we shall ensure that a suitable summary is included. We shall also link reviews to specific papers. Some library papers (particularly new ones) will be reviewed and discussed on the learning thread. We will have a glossary of terms, including definitions of key regularly used names and a list and explanation of all the abbreviations used.This will be a marathon project and it'll take time to evolve. We want to ensure a high quality and easy to use facility. Overall, it will provide the structure and track to run on for those wishing to learn more or those wishing to access one or more specialist papers with all the links to papers sitting in the appropriate places. 3. Once the library is up and running, we already have a large number of papers and links to go straight in there. We have found some great material and much of this will also appear on the learning thread during the coming weeks and months. This should generate further debate and discussion. So just as the winter model thread goes into hibernation, we shall be focusing almost our attention on the learning thread and the library. We invite those who wish to learn more about various aspects of the key teleconnections to join us on the learning thread.  We have also been approaching a few specialists (many outside of the NetWeather community) and we will be inviting one or two of them to make posts or guest appearances on the learning thread. Remember, the thread is intended for "everyone" who has any interest. We wish to attract those on all points of the learning curve from beginners through those with a basic understanding who, like me, wish to learn much more, to those with a much greater technical ability, professionals and experts. The library in itself should prove to be a popular attraction. The CFS forecast is for 30 days ahead and has four ensemble members. The GEFS forecast is for 16 days ahead and has it's usual 20 members, plus the control and GFS operational runs included. We shall be keenly comparing the two during the coming weeks. GEFS AAM forecast model has a known permanent negative bias and this already shows up clearly. The third chart above is from the Nicholas Shiraldi Albany site showing the GWO phase chart for global relative AAM. The four CFS ensemble members are shown individually below. There are some contributions from professionals and NetWeather's @lorenzo also posted on there! We shall be reviewing some of these posts in the coming weeks on the learning thread and there are many links to other specialist papers which will be going into our library. That reminds me, NetWeather has some terrific archived threads too, including the one I refer to on the opening page to this thread opened by @chionomaniac in 2012 which ran for about 18 months entitled "Technical Teleconnection Papers". Again, the vast majority of these papers are still highly relevant today and most of these will be going into our library too and the best ones will be resurrected and reviewed on the learning thread. From my research I can see that we had several earlier periods when there was raised interest in AAM and how it fitted in with the other key drivers. This was around 2001 to 2003, 2009 to 2013 as well as right now. Specific significant weather events have triggered much of this additional interest. We had the SSWs in 2009, 2013 and 2018. In 2002 there was a major warming that affected the southern hemisphere. The reduced interest in more recent years was partly due to two NOAA scientists retiring. Weichmann & Berry developed the GSDM model (see below for more details) in 2007 and ran it until 2015/6. When they retired, they took the copyrights with them and NOAA dropped their vitally important updates from their Map Room and never replaced the scientists or the model. 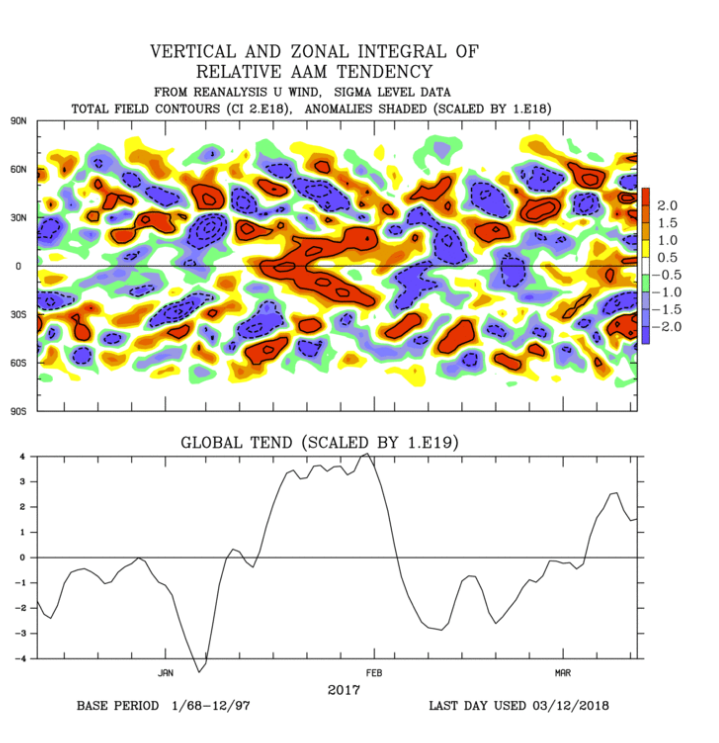 One of my missions is to ensure that AAM regains its rightful place as being understood as one of the key drivers of global weather patterns including its significant impacts on the lower stratosphere through Rossby Waves and positive mountain torque. We have found many papers on this relationship and we will have a special feature on the AAM/Strat relationship in the learning thread in due course. At the moment, @Blessed Weather (who, like me, is thoroughly embracing this subject and wants to learn a lot more) @ghoneym and I have been overwhelmed by the amount of papers and data that we have found dating back into the 1990s but also including some very recent work. This quasi-phase space diagram has global relative atmospheric angular momentum (AAM) anomalies on the x-axis plotted against global relative AAM time tendency anomalies on the y-axis. The labels represent standardized anomalies where a 1968-96 mean climatology and a 1968-2006 standard deviation have been used. The standard deviation for global relative AAM is 1.2x1025 kg m2 s-1 and for the global tendency is 1.8x1019 kg m2 s-2. 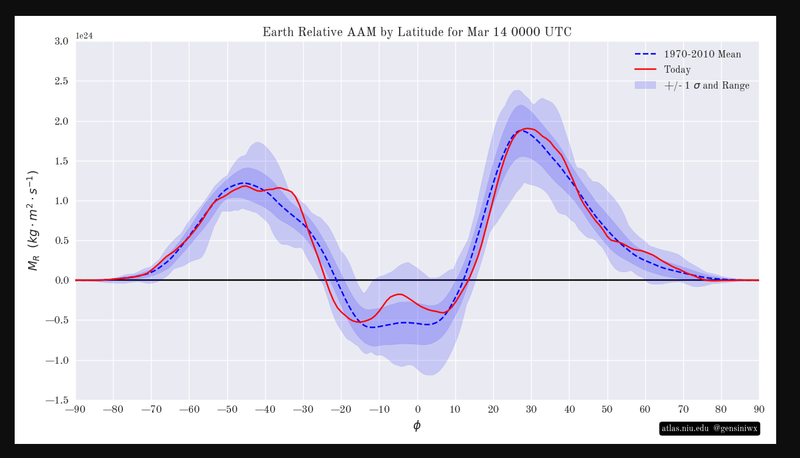 The daily global AAM tendency is estimated from the global AAM time series using a 5-point numerical scheme. The chart provides a gross assessment of the stage of the Global Synoptic Dynamic Model (GSDM) discussed in Weickmann and Berry. The clockwise rotation of the trajectory depicts an atmospheric "mode" that is termed the global wind oscillation (GWO). The GWO varies in time and space but remains quite simple as one goes beyond the variations in global mean AAM. 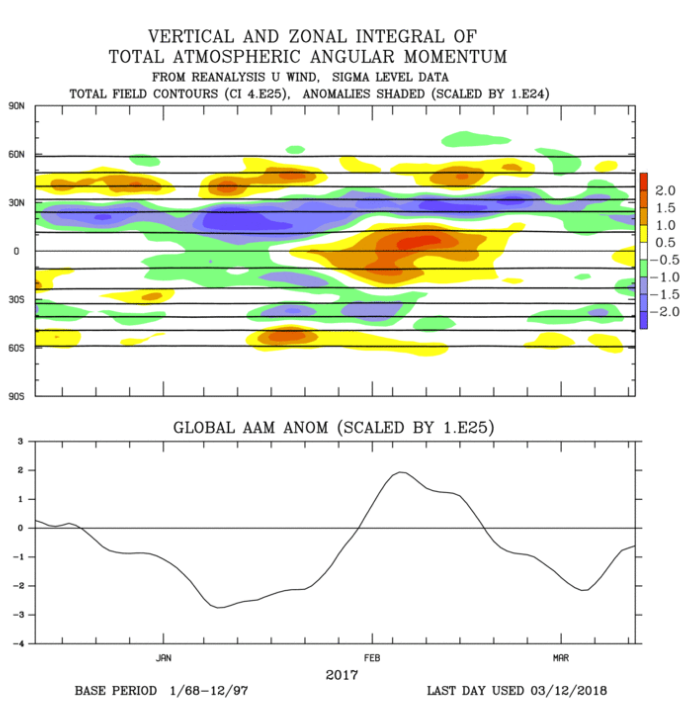 For zonal AAM averages, GWO zonal wind anomalies build up in the upper troposphere near the equator and shift poleward and downward as they expand or move into mid-latitudes. There is also a movement of anomalies from the Western to the Eastern Hemisphere. Thus the zonal mean or wavenumber zero component is closely linked to a wavenumber 1 disturbance. The temporal behavior of the GWO is a mixture of slow oscillations and non-oscillatory, red noise-type variations. On average, the GWO evolves coherently between 30N-30S. The global AAM anomaly is a useful but simple monitoring index of this behavior. The four primary phases of the GWO are described below. 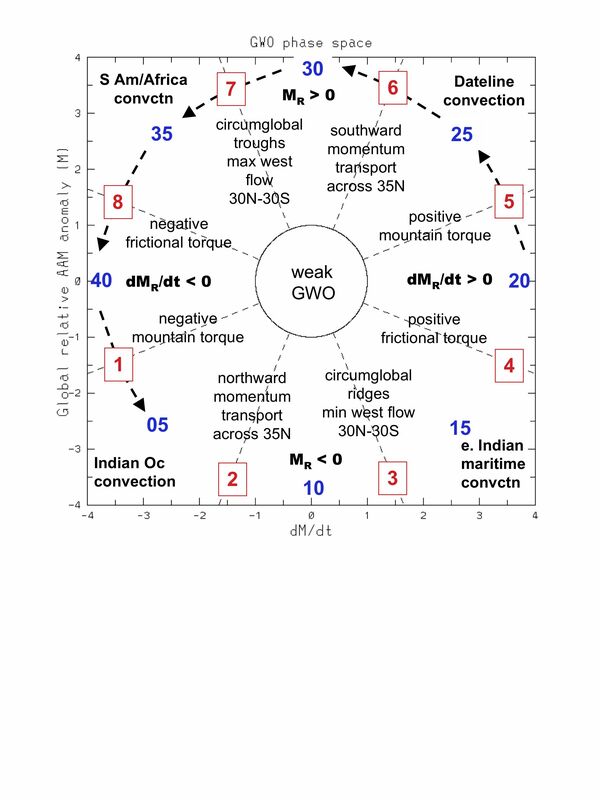 The GWO recurrence interval, or "time it takes to make a circuit", ranges from a broad 15-80 days. Two of the stages project strongly on El Nino and La Nina circulation states, which are also characterized by positive (Stage 3) and negative (Stage 1) global AAM anomalies, respectively. Stages 2 and 4 are transitional. Stage 1 (La-Nina like) the global relative AAM anomaly is negative. 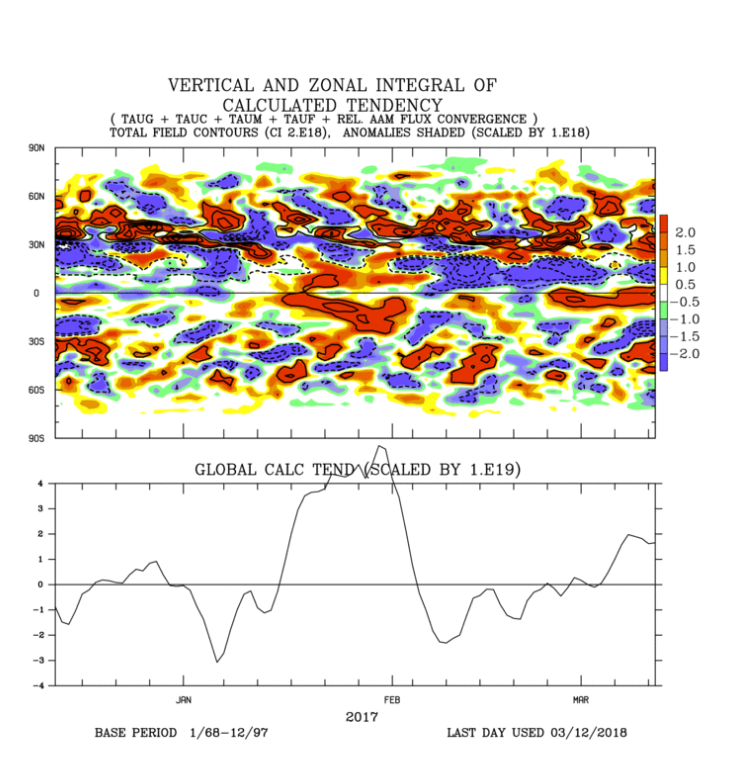 The negative anomaly is primarily due to easterly upper level wind anomalies that extend from the Eastern Hemisphere tropics to the Western Hemisphere mid-latitudes. A retracted Pacific Ocean jet stream is a key feature in the total field. Stage 2 - the global relative AAM tendency is positive. This means that negative AAM is being removed from the atmosphere by surface friction and mountains. At the same time, westerly wind anomalies are intensifying in equatorial regions of the Western Hemisphere. Fast Rossby wave dispersion events in both hemispheres are a coherent feature of this stage and Stage 4. Stage 3 (El-Nino like) the global relative AAM anomaly is positive. Westerly wind anomalies move into the Eastern Hemisphere, broaden in latitudinal extent and link up with deep westerly flow anomalies over the mid-latitude Western Hemisphere. An extended Pacific Ocean jet stream and southward shifted storm track is observed. Stage 4 - the global relative AAM tendency is negative. 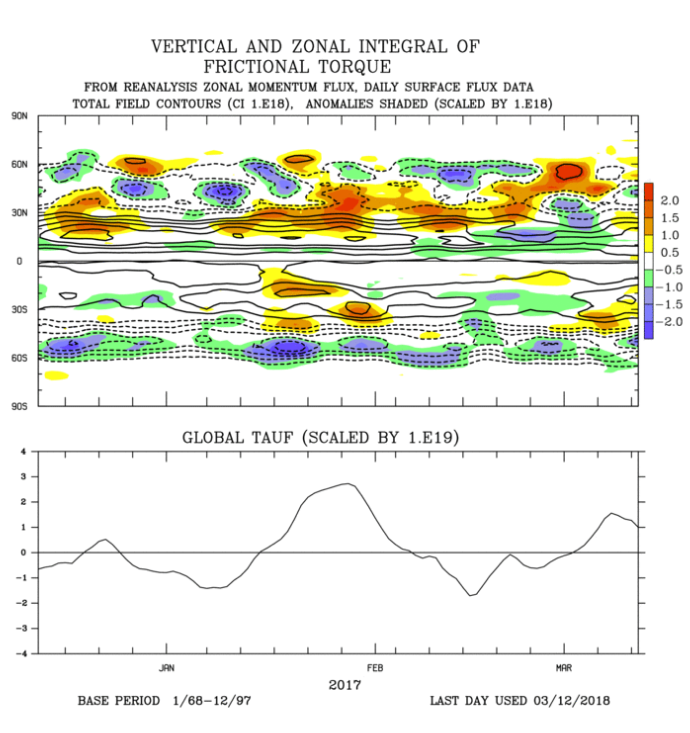 Positive (westerly) AAM anomalies are being removed by surface friction in the Western Hemisphere mid-latitudes and through mountain torques across the Northern Hemisphere topography. The next phase of the oscillation is represented by easterly wind anomalies intensifying over equatorial regions of the Western Hemisphere. This stage has enhanced subtropical jets and closed lows in the subtropics. When the Madden-Julian Oscillation (MJO) is active, it contributes to well-defined, broad "trajectories" in the GWO phase-space. Another slow, subseasonal process is a friction-mountain torque index cycle that also contributes to forcing the trajectories. It appears these two "slow modes" can interact and possibly excite one another. The friction-mountain torque index cycle includes teleconnection patterns like the PNA and the NAO. These equivalent barotropic patterns contribute to exchanging large amounts of angular momentum between the ocean-earth and the atmosphere through their surface wind anomalies. 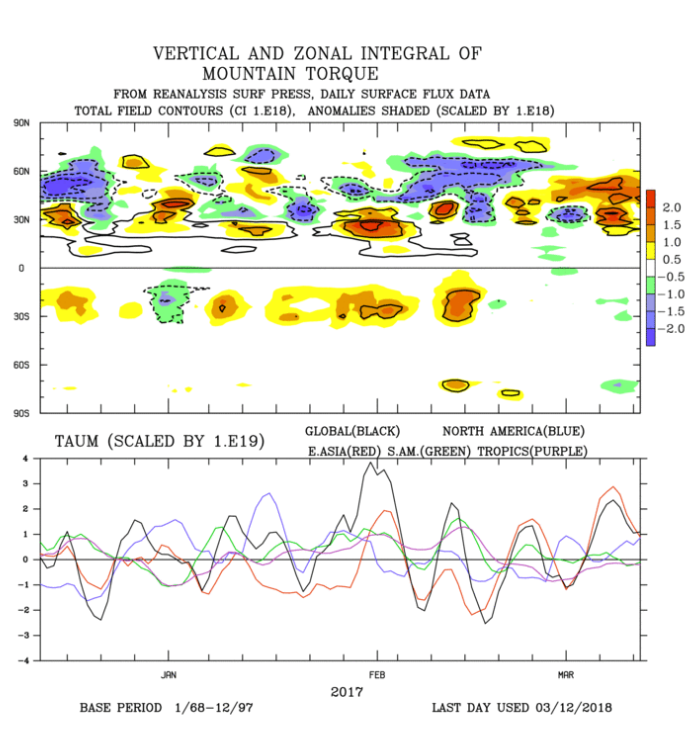 Despite the emphasis on the mountain and frictional torques for the global AAM variations, the subseasonal zonal AAM is dominated by zonal mean momentum fluxes. 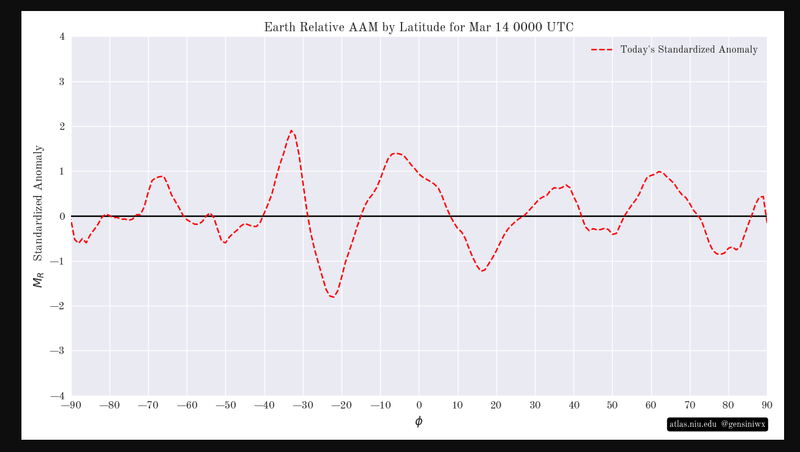 On average there is a difference between the latitude band where a torque generates an AAM anomaly, the band where the anomaly appears in the atmosphere and the latitude band where it is removed. This can be attributed to the role of momentum fluxes. The flux convergence of AAM is the dominant forcing for the poleward movement of zonal AAM anomalies. The torques appear as a response to the propagation of anomalies. The systematic poleward moving source or sink of AAM is produced by the phasing of fluxes due to tropical zonal mean mass circulations and those due to mid-latitude synoptic and other eddies....."
I struggle with the mathematical formulae but most of the text is easy to follow and understand. I'm sure that this post is part of a much longer blog (with charts) and we'll try and find it for the learning thread and the library. You'll see that I highlighted in bold one of the paragraphs above and I should mention that @Tamara (who many in our group are indebted to for her help and guidance in this whole AAM learning curve) has drawn to my attention that the MJO is only part of the story and that the other processes that Anthony Masiello describes are very important aspects of the GSDM. This is something that she stresses in many of her posts on the MOD as quite a few readers either aren't aware of or do not understand and treat the MJO as a stand alone driver. The interaction of forcing between the tropics and the extra tropics is a crucial part of defining the GWO orbit and is therefore also crucial in framing jet stream patterns and the synoptic pattern. I partially quote Tamara there and those that study her posts or read some of the posts on this learning thread will quickly appreciate that AAM and the torques are the key drivers and that the MJO is simply a part of the process. I've added a few "current" charts below which are relevant to the text above (you can also refer to my post at the top of page 3 on this thread for further details). That's more than enough to go on with. Recent studies have indicated the importance of fall climate forcings and teleconnections in influencing the climate of the northern mid-to-high latitudes. Here, we present some exploratory analyses using observational data and seasonal hindcasts, with the aim of highlighting the potential of the El Niño-Southern Oscillation (ENSO) as a driver of climate variability during boreal late fall/early winter (November/December) in the North Atlantic-European sector and motivating further research on this relatively unexplored topic. The atmospheric ENSO teleconnection in November/December is reminiscent of the East Atlantic pattern and distinct from the well-known arching extratropical Rossby wavetrain found from January to March. Temperature and precipitation over Europe in November are positively correlated with the Niño3.4 index, which suggests a potentially important ENSO climate impact during late fall. In particular, the ENSO-related temperature anomaly extends over a much larger area than during the subsequent winter months. We discuss the implications of these results and pose some research questions.